Miola rose early, before the first streaks of dawn began to paint the sky. The rest of the village slumbered in their burrows as she led Marigold, her pony, from her stable. The golden-colored pony snuffled sleepily at her oats as Miola put on her saddle and bridle, along with her traps and snares and arrows. It was the first year that Miola had been tasked with hunting the beast for Harvestmath, and she took her duty very seriously. The Harvestmath feast was the biggest and most grand of the entire year, celebrating the fruitful summer harvest and preparing for the long, cold winter ahead. Such a meal had to be truly special, and the centerpiece had to be something extraordinary. On most mornings, Miola checked her snares for rabbits, or shot quails with her bow. Those were perfectly fine — rabbit stew with pepper and fresh vegetables was lovely, especially on a cold morning such as this — but Miola wanted to impress everyone. Some had said she shouldn’t be allowed, she was too young and a woman on top of that, but the planners had given her the task, and she intended to fulfill it. The pony’s breath chuffed out in clouds of steam as they rode out across the meadows, the grass still tipped with frost. They would have to venture further out toward the woods for larger game, they avoided the village for the most part. Sometimes they would see boars rooting around for acorns by the big oak trees, or once in a while a bear would peek out from the edge of the wood. Miola’s imagination wandered, lulled by the pony’s steady rhythm as she walked; a boar roasted with tart green apples, with fragrant leaves stuffed inside. Or perhaps a pheasant, with a bog-berry sauce, wild grains and herbs a perfect complement to the rich meat. She imagined the gasps and murmurs of excitement as the main course was revealed, the eager clink of silver on porcelain plates as people lined up to eat. Her father had taught her to hunt from the time she was very young; she tied her snares and made her traps herself. Some were even of her own design, and she was especially proud of these. She knew all the rabbit runs around the village, and the places where the quails liked to forage for food. You could prepare for success with a hunt, but never truly guarantee it. The unexpected could always happen, and you must be ready to adapt. It was one reason that hunting never got boring; it was different every time. Miola didn’t know what sort of animal she might find today, or even if she might be able to bring it down. But she knew she could not disappoint everyone by returning empty-handed. Marigold paused and tensed beneath her, and Miola slid down from her saddle, tethering the pony to a small stand of trees. The pony’s fuzzy ears remained alert, turning this way and that to catch sounds. There had to be something near. Miola unhooked her bow and tested the sinew to see that it was taut, stuffing a handful of arrows into her quiver. And, as added insurance, she laced her knife to her hip. Though the morning light had peeked over the mountains, frost still outlined the grass and leaves, and Miola could see where it had been disturbed by the passage of some animal. The ground cover was too dense for tracks, but its body heat had left a trail of melted frost that led into a dense clump of trees. A shrill cry broke the morning silence, reverberating in the foggy air. Miola’s mind raced as she tried to identify it. It sounded a bit like a deer, but not exactly. Her heart thumped quickly as she crept closer, crouching in the cover of the bushes to assess what she was facing. She very nearly let out a gasp of surprise when she saw a massive creature tearing at a carcass, the blood still steaming with heat. It wasn’t a wolf, though that was the closest thing that Miola could compare it to. Its muzzle was shorter and stockier, its teeth longer and more jagged. The ears were tiny, pressed against its broad head, and its shoulders rose in a steep mountain over its back. Its fur was patchy and bare in places, looking as if it might be ill, and it had a faint pattern of black stripes criss-crossing its back. The poor creature beneath its paws was a fawn, and now Miola saw the rest of its family — a twin, and the doe lay lifeless nearby. Miola’s shock became anger at the waste of it all, even at that size, it could not possibly eat three whole deer. It killed wantonly, out of pleasure and not out of need, and there was no worse crime so far as a hunter was concerned. Miola did not enjoy the killing part of the hunt, to the contrary, she always felt a pang of regret as she loosed an arrow. But she knew it would not be wasted, and the people who ate the meat would be thankful for it. This thing felt no such respect for the carcass that it tore beneath its bloodied claws. Swiftly, Miola drew an arrow from her quiver and pulled it taut with the string. Unfamiliar with this animal, no doubt it would be vulnerable in the same places all others were — the heart and the head. She was unsure where its heart might be, so she took aim for one of the tiny eyes. Its skull looked thick and heavy, but she had the advantage of surprise, so she could take the time to aim carefully. The arrow whistled through the air and the creature jerked its head up in surprise, the arrow lodging into its neck. Miola frowned and nocked another, aiming again for the eye. A neck wound was a good hit as well, but she wished to fell the creature quickly. Its neck looked strong and muscled, and might not be fatal. It uttered another of those eerie cries as it began to turn and run further into the forest, but this time Miola’s arrow found its mark. It took one more step, and then its legs crumpled beneath it as the arrow went through its eye and to the brain. She waited to ensure that it was truly felled before she approached, her knife in hand. It looked like the creatures her father had shown her once in a book, vile servants of evil. Normally they moved in packs, so there might be another nearby. Miola did not wait around to find out. The first fawn was completely destroyed, its poor tiny body torn to shreds by the beast’s ragged claws. But the other two, while dead, did not look to be touched. Was it safe to eat them? Miola was not sure. They showed no signs of being tainted, they looked as they must have just before the beast struck them down. At least if she brought them back, their deaths would not completely be a waste. Miola laced the legs together and tied them behind Marigold’s saddle to secure them for the ride back to the village. No one would believe such a tale, would they? Miola glanced back at the ugly thing, stretched out on the ground. Its fur was sparse, but the skin was thick. Perhaps its leather would be useful — she could use a new hunting cloak, especially now that the weather was growing colder. She unsheathed her knife and soon had tied the beast’s pelt alongside the deer for the trip back to the village. Miola the Wargslayer, she thought that had a nice sound to it. She let her mind wander to venison recipes as she turned Marigold back toward their village. Smoke stung Hraavik’s eyes and nose, yet he kept moving toward it. He was flanked on either side by his pack-mates, scars written across their hides. The smoke was made by the tall ones, and the pack had learned that it was better to go along with their plans. For generations they had hunted alone, sought out their prey among the forest, anyone who was foolish enough to venture too far from their settlements. But now the tall ones came among them, calling the pack with their horns that echoed through the valleys. There were others gathered too, the many-legged ones and their strange hissing ways, but the tall ones were in charge. At first Hraavik resisted this, for he was the leader of his pack and was not accustomed to bowing to anyone’s word. But the tall ones had sharp metal, axes and whips and had no fear of him. And, as he soon learned, the tall ones had little interest in the meat of man or hobbit. All of the spoils went to Hraavik and his pack, they could eat until their bellies were full and taut. Thus did he and his brothers begin to associate the tall ones and their horns and smoke with hunting, and the sweet taste of easy meat. They lay on the black dirt that surrounded the fire, their eyes bright with greed. The tall ones spoke of their plan, but it mattered very little to Hraavik. He knew already what to do; he simply needed to be told where their prey was hiding. Did they tremble already in their burrows, frightened by the war horns? Or did they carry on with their business, blithely unaware of the danger that rested only a short distance away on tense paws. Hraavik liked it better when they ran away — it made the game more exciting. The tall one’s leader wore a skull atop his head, the antler tines broken and intertwined like the branches of a lightning-struck tree. His gaze rested upon Hraavik for a moment, appraising him and his pack. Hraavik was not concerned. He had chosen his best hunters to accompany him today, the rest could squabble over the scraps if there were any left. The more prey they brought down, the more the tall ones would be pleased, and they would call for him again. The tall one chief said something to another, but Hraavik did not know what it was. They waited with restless energy, their jaws slavering with anticipation. They did not have to wait long. The war horn reverberated through the camp, stirring all who had gathered. Like a black wave they poured from the valley and toward the settlement. Hraavik and his pack broke off from the main group, disappearing into the shadows of the grass. Ambush was the key to a successful hunt, prey caught off guard was as good as dead already. They could run at an even pace across many miles, and their bodies were taut with muscle, but they were not especially fast. Hraavik would strike swiftly from the shadows while the rest of the army attacked another point. He could already taste the warm blood upon his tongue, it was so near now. It was a hobbit-den, built into the sides of the surrounding hills. Some worked outside, tending to plants or washing clothing. Chickens and goats wandered the pathways, and young hobbits played games on the sod roofs. The jumble of smells and sounds was jarring to a younger warg, but not Hraavik and his hunters. They moved into position, Hraavik licking his jaws in anticipation. There might be weapons, but in Hraavik’s experience, it was rare. He hated the stinging things the most – they could reach from a very far distance and stuck into your hide. The last time he’d had to chew them out and one had become infected. Better to kill any before they were able to sting them. At the edge of the field they waited, concealed among the crops, until the tall ones’ signal. Since Warlords launch, it’s been a while since I posted about any not-Wow games! SWTOR’s Shadow of Revan expansion is out, I bought it (because it was cheap, only $20) but haven’t had a chance to play it yet. I need to figure out the new combat proficiency system. It appears to replace the old talent trees, but I’m not sure just yet. Admittedly, I am pretty bored in WoW outside of RP and raid nights, so I may start taking Kazta through the new content. There’s a new planet and, hopefully, some good storylines there. I was a little disappointed in Makeb in that there weren’t really any class-specific quests, but it still wasn’t bad. I still have tons of fun playing her and I do really enjoy SWTOR when I get the chance to play it. That and RIFT would be the games I’d play if WoW closed or my friends all stopped playing. Update: Just read on the developer blog that one of my favorite races is becoming playable! That definitely gets me excited to play again. I think there’s a new expansion out, but I am not sure. My highest character is level 54, and I believe the max is 100 now, so I’m so far away from current content that I have no clue. I’m one of those super noobs who never even gets to max level, and they keep raising it! It doesn’t help that I’m in Moria, which is a zone I really disliked the last time I tried it. It’s very difficult to navigate (there are a lot of elevation changes) and also incredibly dark. I had to adjust my screen to be able to see anything at all. They might have changed it since then though, it was several years ago. This is another one that I wish I had more time to play, for a time I played it a lot but I never was able to find a guild (despite a lot of trying) so my interest kind of waned. Unfortunately, my house got locked due to lack of payment, but I was able to unlock it again, for much less than last time. That’s a relief! So my “rent” is paid up through April again. I’d like to play again sometime, I just don’t have enough free time! I’m stalled out on my second playthrough, right after the Orlesian ball quest. It’s really hard to find the motivation to play at all, especially to do all the pointless side quests. Part of this is because I know how boring and grindy it is, and there’s no mystery about the storyline so it’s less urgent that I level up to see it. I’m pretty much just playing to see the result of the romance arc at this point. But even that’s not especially compelling, as I think I’ve pretty much got all the scenes I am going to get with that character. It kind of baffles me to see people rave about how much they like it, when my experience has been so different. Maybe I’m just jaded or something, but I honestly would rather play the entirety of Origins (yes, even the Fade and the Deep Roads) than finish this second play through of Inquisition. I wanted to like this game, but it’s honestly just not very fun at all. 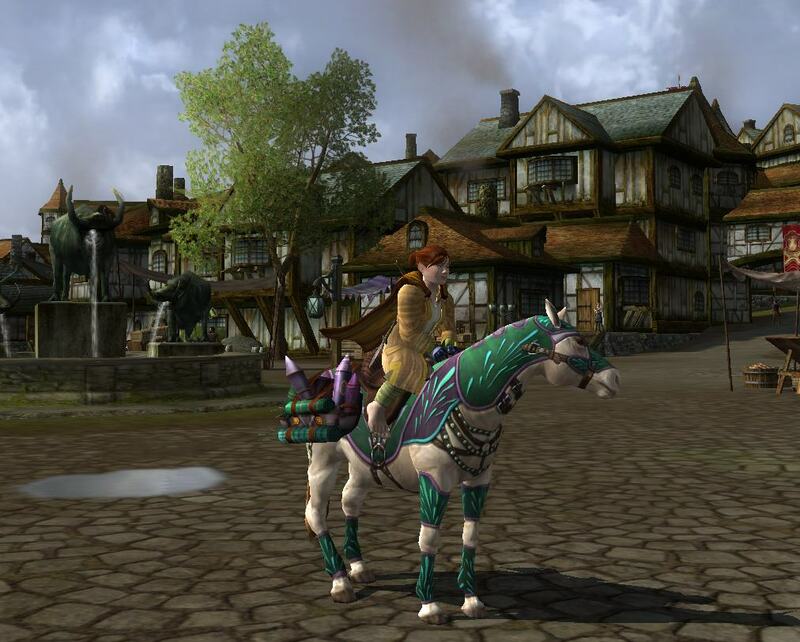 This morning’s update put in a new horse, a recolor of the Fireworks-Laden steed. I was able to buy it on my Hobbit, not sure if the others will get enough in time (it ends tomorrow). Best part is that her name is Sparkle! 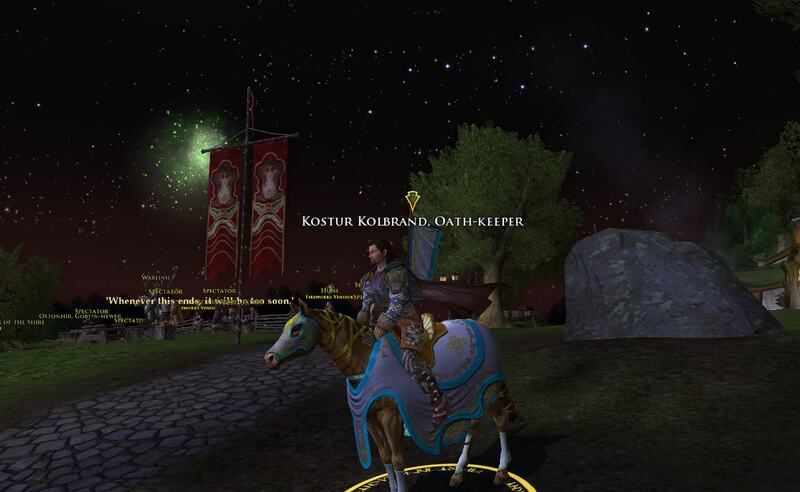 The LOTRO Anniversary event is going on right now, I have most of the stuff I want from this event so I’ve just been doing the “envelope” daily on all my characters. These can contain items such as emotes, the anniversary coins, or even mounts. At least, they did last year. As far as I can tell there is only the festival barding set this year. I’ve found it on one of my characters, but since you need level 75 for a war-steed, I can’t use it yet. That’s incentive to level, I guess! I was able to buy the Anniversary mount for everyone, though. I really like that they’ve made festival horses much easier (cheaper) to get. It cost me nothing but the anniversary coins. Since it’s free, I really can’t complain about its looks but… yeah, definitely not my favorite mount. Most of the time, LOTRO mounts do a great job of striking a balance between realistic and interesting, but this one’s just plain silly. Okay, well that wasn’t too long. Though all of my characters did some quests last year, so they might count toward it? I dunno. Here’s Andarthir with the Wintry Yule Steed! He’s also wearing a Yule hat that he won from one of his bags! And this one, which I think is from last year? I dunno, Morthorn had enough tokens for all three. And he’s wearing the title you get from building all the different snowmen!